With the advent of the New Year 2016, there are an array of films that have been lined up for release during the year. Kick-starting this year is the Bejoy Nambiar directed WAZIR, a film that's based on chess. After the yesteryear's cult film SHATRANJ KE KHILADI, the Amitabh-Farhan starrer WAZIR seems to be the only film that has chess as its central theme. Will WAZIR 'check-mate' its opponents (competition) or will it get 'beaten' at the box-office, let's analyze. There's a popular rule in the game of chess, which states 'If you find a good move, look for a better one'. Loosely based on this thought, the film's screenplay (Bejoy Nambiar and Abhijat Joshi) takes the viewers through a gamut of emotions in the film. The film starts off with 'musical introduction' of the dynamic ATS officer Danish Ali (Farhan Akhtar), his wife Ruhaana (Aditi Rao Hydari) and their only child Noorie. One day, when Danish is out with his family, his razor-sharp eyes spot a dreaded terrorist Rameez (Naseer Husain). What follows after that is a series of chase sequences, which results in the sudden death of the innocent Noorie. Completely shattered by the death of his child, a mentally disturbed Danish Ali lands up 'eliminating' Rameez, which results in him being suspended from his service. Unable to bear the grief, one day, just as he is about to kill himself, there enters a chess champion named Panditji aka Omkar Nath Dhar (Amitabh Bachchan) in his life. He, then, teaches Danish the 'similarities' between the 'game of life' and the 'game of chess'. Gradually, the two become the best of buddies and start spending time over drinks and chess. One fine day, Panditji reveals to Danish that his daughter was murdered by the politician Yazaad Qureshi (Manav Kaul) and that he is waiting to take revenge for the same. Danish joins Panditji in his battle against Yazaad Qureshi. As days pass, Danish realizes that Yazaad Qureshi is not just a mere politician, but is more than what meets the eye. Just when Danish plans to eliminate Yazaad Qureshi, Panditji gets 'attacked' by a certain mysterious villain named 'Wazir' (Neil Nitin Mukesh). What happens towards the end is something that turns Danish Ali's world upside down. Who is the real 'Wazir', what happens to Panditji in the end, does Danish Ali become successful in eliminating Yazaad Qureshi is what forms the rest of the film. Director Bejoy Nambiar, whose last film as a director was the action-thriller DAVID, returns to the silver screen with his latest flick WAZIR. The sad part is that the film falls flat, courtesy, the poor and aimless direction. Like his earlier film DAVID, WAZIR too falls under the category of 'high on style, zero on substance'. WAZIR, which starts off on a promising note, starts losing its steam as the film progresses, because of too many dull moments in the film. The film suffers big time from the lack of able direction, unconvincing plot and for the want of a good and flawless screenplay. The film's script is so convoluted that it leaves the viewers with more questions, rather than giving out answers! What one fails to understand is that how can the director afford to do many senseless things in the name of 'cinematic liberties'. How can he explain the fact that, despite Farhan Akhtar being suspended from police service, he still carries a fully loaded gun and can 'call for action' as and when required and many such instances. 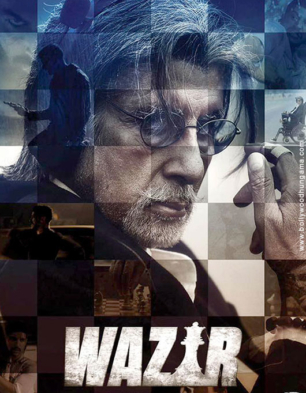 All in all, WAZIR is a perfect example of a good concept gone wrongâ€¦ terribly wrong. As far as the performances are concerned, it is indeed the megastar Amitabh Bachchan who leads the way as Pandit Omkar Nath Dhar. Even though he plays a handicap in the filmâ€¦in no way, that acts as a handicap in him delivering a superlative performance. On the other hand, Farhan Akhtar excels in his character of an ATS officer. He does total justice to the mannerisms and behavior as a tough cop. He successfully delivers numerous shades to his performance. Neil Nitin Mukesh, who was a part of the goldmine hit Prem Ratan Dhan Payo last year, disappoints sorely in WAZIR. He is totally wasted in the film. Ditto for John Abraham. On the other hand, Aditi Rao Hydari delivers what is expected of her. Other actors in the film help the film in moving forward. In a film like this, where the story plot is the mainstay, there is hardly any space for music. Despite the film boasting of an array of music directors (Shantanu Moitra, Advaita, Ankit Tiwari, Prashant Pillai, Gaurav Godkhindi, Rochak Kohli), the songs fail to leave an impact. It is actually the music that slows the pace of the film. At the same time, the film's background music (Rohit Kulkarni) is impactful and effective. While the film's cinematography (Sanu Varghese) is decent, the film's editing (Vidhu Vinod Chopra, Abhijat Joshi) lacks style and substance. Typically, in any whodunit thriller, the final revelation act should and must act as a bolt from the blue to the viewers. In the case of WAZIR, this is completely missing. It seems that the film's makers have taken the audiences and their sensibilities for granted. On the whole, WAZIR, despite boasting of some of the great performances, reasonably fails to leave the desired impact because of its convoluted script. At the box office, the film may just about appeal to a handful of the multiplex audiences who would want to get a taste of Bollywood entertainment in absence of any new film releases since past three weeks.